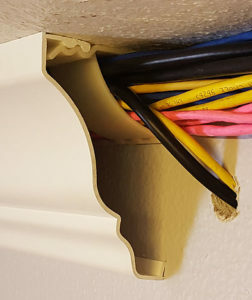 Spexco, LLC identified a need in the retro-fit market for a more decorative solution to install cabling throughout existing structures that would be fast and easy to install with little or no carpentry skills while adding an appealing finish for corridors, rooms, and home theaters. After a few years of development, our finished product has become the ideal solution that is quick and easy to install without the unnecessary disruption to tenants that traditional methods of concealment just don’t offer. Raceway Crown is secure while remaining removable for future upgrades and a superior choice over the outdated raceway systems that are currently available. We take quality control very serious at Spexco. We manufacture all of our products, including our tooling, in the USA. We are constantly monitoring our manufacturing processes to provide our customers the best quality products possible. Our commitment is to common goals based on open and honest communication while showing concern and support for each other. Our dedication to satisfying our customer needs extend to our honoring of commitments made to them. © Copyright | SPEXCO. LLC. | Designed by M2A Solutions, Inc.